Our Gauges come in two packages, round and square. Round Gauges: Our round gauges are 100% billet machined aluminum. They are an industry standard 2-1/16" round. They use a large low profile nut on the back to secure the gauge in a panel or POD, Not a silly stamped metal "u" bracket like the competition uses as those can cause serious installation issues. The Gauges are not fully sealed for outdoor use but can be used for motorcycle applications that are not driven in the rain. 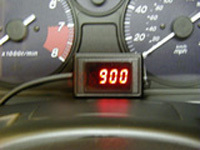 The Gauges come in different configurations as shown below. Just pick the options you want during the order process as it will ask you the options available to you. The options are endless! Design your own custom gauges to match your car today. Square Gauges: Our Square gauges are very compact! They come with velcro to stick it anywhere. All square gauges are ABS Plastic and the size of a car keychain remote. Dimensions of Square Gauge: L=2.12" D=.6" H=1.37"